They’re Clementine oranges! And they’re called Darling! 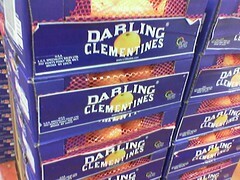 As a reference to the song “Oh My Darling Clementine!” Isn’t that clever? I think it’s clever! Apparently they either don’t remember the Bobby Darin version, or they’re hoping no one else does. Though she weighed two-ninety nine.